Polka dots, spots, spheres of any kind – I just love them so I don’t think it’s any coincidence that I get to write about all things round here on Babyology! Fabulous maker of mobiles, Puka Puka, has just released a brand new mobile design, the Polka Dot Modern. 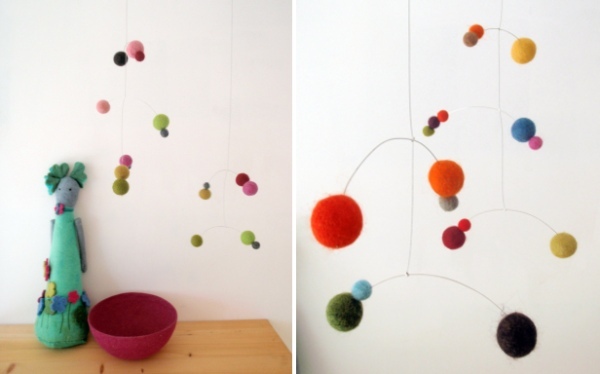 It tickles my retro-futuristic fancy with its beautiful orbs of felted wool on a stainless steel mobile structure. Two colours are available – Spectrum and Spring – so fans of both bright and softer shades are catered for. Everyone at your place will love it, not just the baby! The Polka Dot Modern Baby Mobile is $62 plus post from Puka Puka. Also see our past editorial on Puka Puka products.